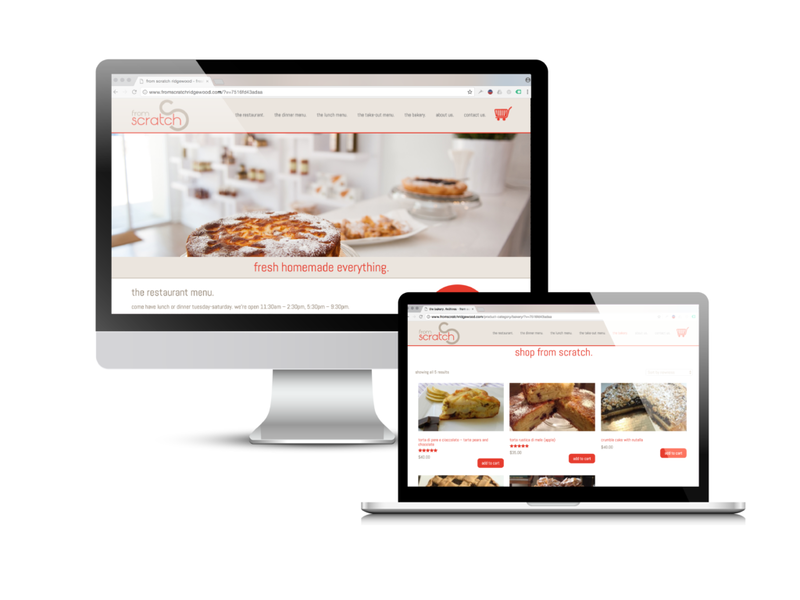 From Scratch owners Claudia and Roberto contacted Crearé Web Solutions in 2013 to help them develop a website for their brand-new bakery, catering, and meal delivery business. The couple had recently relocated from Italy and had a vision to bring the taste of Italy to Ridgewood residents, but needed much more than just a website. From Scratch requested guidance with a full brand development, including choosing a name and developing visual elements such as the logo and typeface. Crearé Web Solutions worked with From Scratch on all aspects of the business launch, from the development of a logo that reflects the company’s Italian roots to the creation of an easy-to-use web ordering system. Before implementing the online ordering system, we researched many restaurant websites with online ordering capability to identify best (and worst) practices. We built a back-end system using Woo Commerce that allowed From Scratch to manage their inventory and delivery methods themselves. After a year of a completely online business, From Scratch opened a storefront in downtown Ridgewood. Crearé Web Solutions assisted them in editing and expanding the website to add on the restaurant information, and help shift the focus from meal delivery to an eat-in restaurant experience. We also helped From Scratch design their menu, signage, and continue making updates to their website.